When Wine Spectator recently released their round-up of 2007 California Pinot Noirs, they called it the best vintage of California Pinot Noir ever. I noticed an interesting bottle on the cover I didn't recognize- the 2007 Red Car Heaven & Earth Pinot Noir. At 97WS/$60 I consider it a value wine (Wine Spectator has only rated one CA Pinot higher- ever). Paul Sequeira from Red Car Wine Company was kind enough to respond to the following questions. I hope you find his responses as interesting as I do. Q: If you would, tell us a little bit about Red Car Wines and your role there. Paul Sequeira: Red Car was founded in 2000 with the idea of producing delicious, expressive Syrahs from the Central Coast of California. 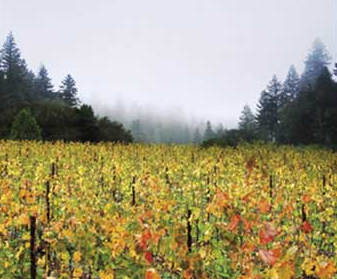 We have evolved since then to produce both Pinot Noir and Syrah, and have moved north to the Sonoma Coast. However, we are still committed to making excellent wines and marketing them in a creative, unique way. Our wines are divided into three tiers. Our most economical tier is called “Boxcar”, and in this tier we make dry Rosé, Chardonnay, Pinot Noir and Syrah. Our middle tier carries the iconic Red Car label, and we have nicknamed these wines the “Trolley” series. At this point we make only a Pinot Noir and a Syrah in this tier. Our reserve wines all tell their own story, both in the bottle and on the label. We made two reserve Pinot Noirs in 2007, the “Heaven & Earth” and the “Aphorist”. Our two reserve Syrahs were called “The Fight” and “Cuvee 22”. I function as both a viticulturist and the director of sales, which is an odd combination. In fact, I’ve never met anyone else with the same job description! Q: Congratulations on the 97 point rating from Wine Spectator. What do you think was it about the 2007 Heaven & Earth Pinot that James Laube liked so much? Paul: I think James Laube prefers ripe, forward, textural wines, be they Cabernet Sauvignon or Pinot Noir, and the 2007 Heaven & Earth fits that description. I personally prefer our 2007 Aphorist, which is much more perfumed and nuanced, but maybe that’s why I’m not a famous journalist. Q: Same question I've asked other winemakers who have received big numbers from Spectator: Where were you when you first heard about the rating? What was your reaction? Paul: Carroll, our winemaker and founder, called me in hysterics. I was on the road – in Maine I think. Neither of us give much weight to critical scores personally, but we both knew what it would mean to the winery in terms of exposure. We immediately froze all sales of the wine until we could allocate the remaining inventory equitably to our customers. It was a very exciting moment – we knew in an instant how differently our year would unfold. Q: There were only 350 cases of the Heaven & Earth produced so it's very hard to find. Which of your wines would you recommend as an alternative that would give us a sense of the style of Pinot Noir that Red Car is making? Paul: Actually, there were only 292 cases produced, and they were sold out almost instantly after the rating became public (they were almost sold out already, and the ratings just sealed the deal). The Red Car 07 Sonoma Coast Pinot Noir (aka “Trolley” Pinot) is the closest to the Heaven & Earth stylistically. It also sold out immediately after receiving 94 points in the same Spectator issue. Our Aphorist Pinot Noir is more aromatic, less extracted, and perhaps more age-worthy due to a higher level of acidity. It is sold out at the winery as well, but may be available on the market. For a bargain alternative, try our Boxcar Pinot Noir, which retails for around $30. Q: Did I read somewhere that you're moving from Los Angeles to Northern California? What's next for Red Car? Paul: The winery moved to the Sonoma Coast just before harvest of this year, which made for a very crazy August. We hope to open our tasting room by the summer of 2010. The most dramatic development for Red Car right now, other than our move north, is that our estate vineyard northwest of Cazadero on the “True” Sonoma Coast will yield its first full crop this harvest. We expect to release the first of our estate wines (both Pinot Noir and Syrah) in the spring of 2011. We have great expectations. I was able to find a couple of bottles of this wine and I cracked one open recently. Here are my tasting notes. Question of the Day: Have you ever tried wines from Red Car? If so, what did you think? If not, would you buy them if you saw them?